In exciting news, last night, Melbourne writer SJ Finn and Sleepers Publishing launched Finn’s second novel, This Too Shall Pass. 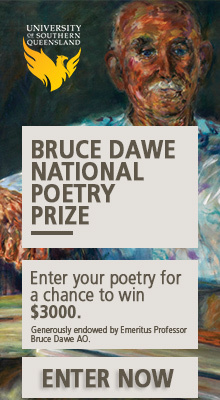 A writer with a diverse oeuvre, Finn is a well-known poet and her first novel, Fine Salt, was published in 2002. 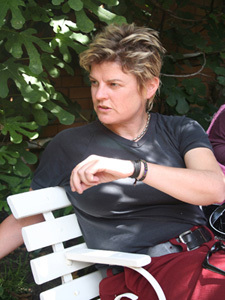 Finn’s short stories have been produced for radio and published in such notables as Going Down Swinging and Sleepers Almanac and in 2010 her short story ‘Angus’s Playground’ was a runner-up in the Australian Book Review short story competition. Last, but certainly not least, Finn writes commentary and review here at Overland. After all, my insides have become similarly nebulous and ill-defined, held together by an equally teetering outline. And I find my thoughts ‘similarly nebulous and ill-defined’ when it comes to articulating how SJ Finn’s novel has affected me. The novel is, on the surface, the story of a woman coming to terms with the breakdown of her marriage, with relinquishing primary custody of her son, and negotiating the impact of this situation on her relationship with her new partner – who brings the added ‘complication’ of being another woman. The backdrop against which this personal journey is played out is the workplace to which the protagonist, Monty, flees from her personal impasse. The workplace undergoes that scourge of all institutions grounded in social welfare: economic rationalism, and Monty is caught up in the machinations and ethical dilemmas of the reorganisation. 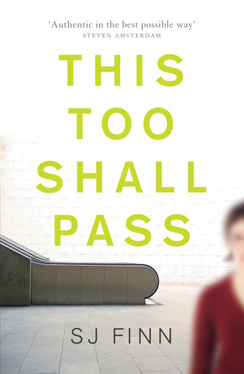 This Too Shall Pass reads like a very personal account, told intimately, between friends. Some of the detail about the reshuffling at work reminded me very much of actual conversations I have had with a ‘real-life’ friend who works in the healthcare sector. Woven into the account are the personal and professional consequences of all-too-common incidents of bigotry and homophobia and the helplessness victims feel in the face of a kind of blanket ignorance, and worse: tolerance of intolerance in the workplace and in the community. I was trampling, not so much over myself as inside myself, up and down on beliefs I’d steadfastly held. Finn paints an understated but very clear picture of the impact of homophobia on the life of her protagonist. The ensuing bigotry and gossip engendered by a loving kiss at a local pub is (as Dave, lover of homilies, might like to say) the straw that broke the camel’s back. Monty and Renny feel driven away from the country to St Kilda, where diversity is less of a problem. The stakes are raised for Monty by her decision to leave her son, Marcus, in the primary care of his father. Marcus then appears as a minor character, a pawn in the games Dave and Monty play as they painfully unravel from each other’s lives yet remain tied by their shared parenthood. The dysfunction of these divorced parents is beautifully drawn – we all know, or have been, or are, these people. And here we come to one of the great things about Finn’s novel for me: it challenged my gender preconceptions. At first, I found Monty’s relationship with Marcus to be told a little coldly. I was unsatisfied. Then I thought about it and wondered, if Monty had been a man who had left his son in the primary care of his ex-wife, would I have even noticed the prominence (or not) of his relationship with his child as a peripheral rather than all-consuming or determining factor in the story? Truth is, probably not. So it was a slap for me and a thumbs up for SJ Finn. But there it is: I have a tendency to belly-on about prejudices and inequalities, oppression and unfairness – all the negative ‘isms’ that circulate our human world. And who knows, there may never have been enough of us pushing for social justice. And perhaps this justifies the heavy-handed way This Too Shall Pass ultimately addresses the use of ‘God’ as an excuse for harassment and intolerance; in sharp contrast to the more subtle ‘show don’t tell’ way the novel deals with community and workplace bigotry. My feelings, I realised, were stalking about on their own and, as such, felt too ruthless. Carefully crafted and honed, Finn keeps the story and the emotions of her protagonist under tight control. I’ve only read the first few chapters of ‘This Too Shall Pass’ but I was enthralled by the beauty of the writing from the very first lines. While I can’t really comment on Monty’s relationship with her son, Marcus, having only read of their first separation, it takes some courage not to give in to the stereotypes created for women. Love has many expressions even maternal love. I look forward to reading about the workplace especially as Finn locates it in the community sector which I know well. And I meant to say, beautifully written review. Thanks Clare. Thank you Trish. I hope people buy SJ Finn’s book – and from a bookshop, too!